Several times this week (at LFUCG and at Ace Book Club), the questions were very specific, and related far more to “how to.” One reader asked if we could put together a “Twitter for Dummies.” Well, Ace Readers are no dummies. But there do seem to be a few myths and misconceptions still floating around that maybe we could clear up. Why does Ace Tweet? For the same reason Ace does everything: to build a Better Lexington. It’s what Ace has wanted for 20 years. It’s what the Ace Readers want. A Better Lexington is good business and a good quality of life. It’s why we celebrate the BEST of Lex. It’s why we all get together to push the same rock up the same hill. Twitter is just another Tool in our toolbox. It allows us to talk with the Ace Readers (not just TO the Readers) 24/7. Twitter is not a radio station where you broadcast, it is more like a 1970s CB radio where you have dialogue (with flashmobs, instead of convoys). What follows are some basics that will get you started, and then some Lexington-specific information. First up, just go to http://twitter.com and it will lead you through establishing an account. Here are a few helpful hints. Keep it short (you only get 140 characters in a tweet—no one wants to waste them spelling out @UniversityofKentucky). Do not use Numbers or Underscores in your screen name. They are unwieldy, especially for people using Twitter on their phones. What is this @ Symbol? Again, for anyone who remembers the 70s, think of it like a CB radio. Your screen name is your “handle.” You will always be addressed by this “handle” and you always use other people’s handles when you want to talk to them. From here, Twitter becomes very intuitive—think of it as Facebook with JUST the Status Updates, and without all the annoying MafiaWars and FarmTown intrusions. In your status update, you might share links about something great you just read, or a photo, or a great idea about what to do tonight in Lexington. If you feel compelled to tweet about brushing your teeth, no one will stop you. Direct Message: Don’t use this when you’re getting started. Click on it to check for “mail” there, of course. But think of it as “Private” Message. Now, think, would you be comfortable seeing this “private message” on the front page of a newspaper (not Ace…necessarily…just in general). If you wouldn’t, don’t send it. It isn’t so much a case of security as it is know-how. Twitter-Rookies invariably think they’re sending a “Direct Message” to a spouse or co-worker about something that should be Private, and they end up sending it out as a Tweet that might become a source of embarrassment…or a grand jury indictment. You’ll get the hang of it, but at the beginning, just steer clear. Twitter is a friendly community, so treat it that way. It isn’t a broadcast forum for mini-press releases, and, contrary to a host of websites and local “Twexperts” who will advise you otherwise, you should not be there to sell stuff. Think of it as a Cocktail Party. Are you the guy who walks in and does nothing but talk about yourself? Well, the same thing will happen to you on Twitter that will happen to you in real life: no one will like you. Would you walk into a cocktail party and immediately try to sell everyone a house? If you did, people would stop inviting you to cocktail parties. Would you argue loudly with everyone at a cocktail party? Well, if you would, stop it. It’s trashy. But a good cocktail party guest will observe for a little while and get the lay of the land to see if they have something interesting to contribute to conversations-in-progress. Try that. Go to “Find People” (at the top right of the screen) and sign on to follow a few locals. Now, just LISTEN. Because that brings us to WHO you will follow. 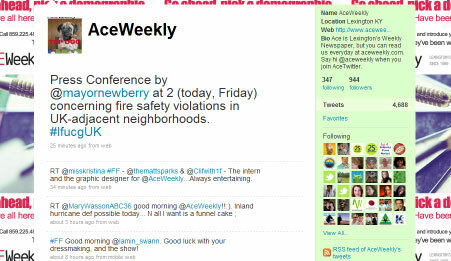 #FollowFriday @AceWeekly for local news, arts, entertainment. This is a very, very abbreviated list of a few people Ace can recommend. To see everyone Ace Follows, when you sign on, just to go http://twitter.com/AceWeekly and click to see the people we follow. The Mayor, the Vice Mayor, and Council Members Lawless and Martin are the only representation the horseshoe currently has on Twitter. @UnivOfKentucky is UK Public Relations. They are good role models, and from them, you will get spirited or friendly discourse, as opposed to anyone trying to sell you anything. Now, GO FORTH and Tweet. Here is an excellent link to a post called: Mom, This is How Twitter Works.